Happy Thursday, friends! It’s been a really cool week, did you see the KUSI news update yesterday where I was showing off a gorgeous Macy’s dress for Opening Day at the Del Mar Track? If not, you can see more on my Instagram HERE and Facebook HERE. I’ll be posting it again tomorrow on my social pages. 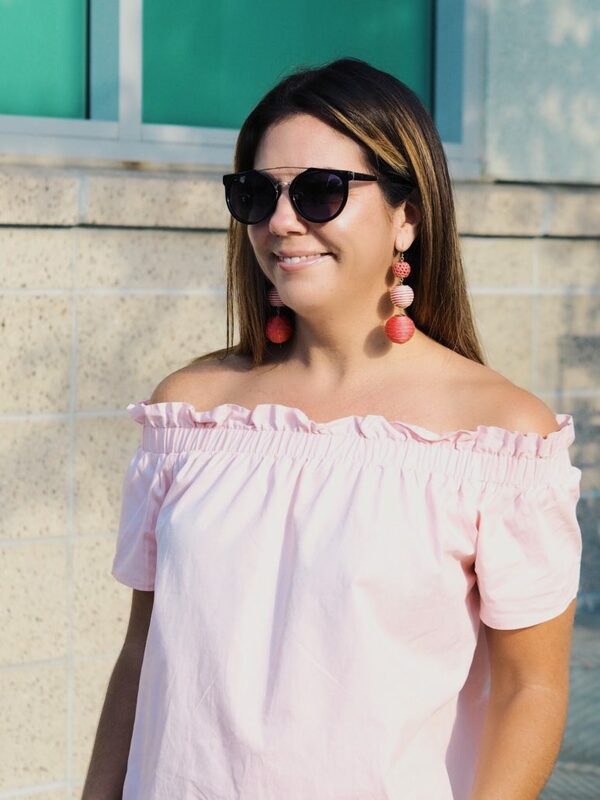 If you weren’t sure, the off the shoulder (ots) trend is here to stay! 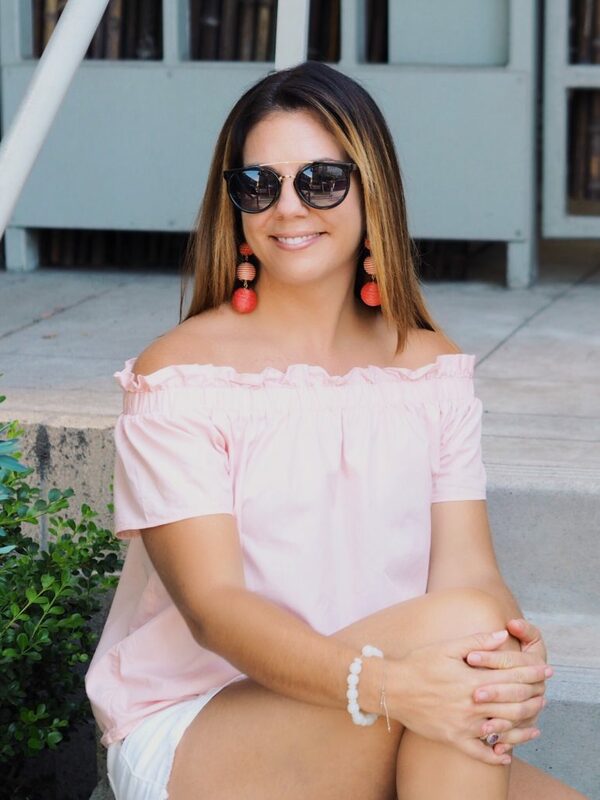 Pinks and blushes are perfect for summer and go beautifully with the off the shoulder trend, add a little ruffle and I’m sold! (At the right price of course). 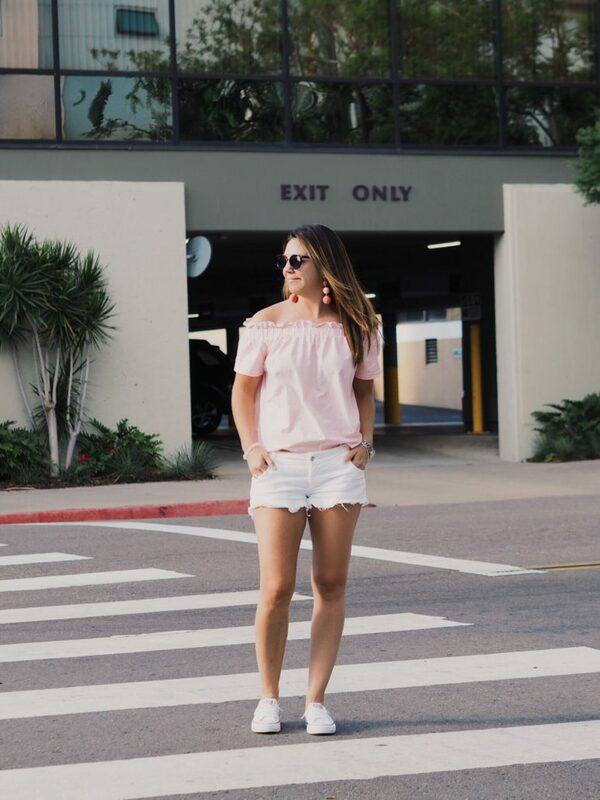 This adorable blush OTS top is available at Vocabulary Boutique (going fast) in Little Italy, San Diego and I linked a few similar other options below. If you’re local, in San Diego (or visiting) you need to check out Vocabulary Boutique. It’s an adorable little boutique in the Little Italy neighborhood with the latest fashion trend pieces, cute dresses, tons of cool locally made jewelry a few men’s items and lots of cool trinkets. I love popping over on the weekends after the farmer’s market to see what’s new! They also have a styling boat cruise, coming up, check out it out HERE, this is going to be a fun event! 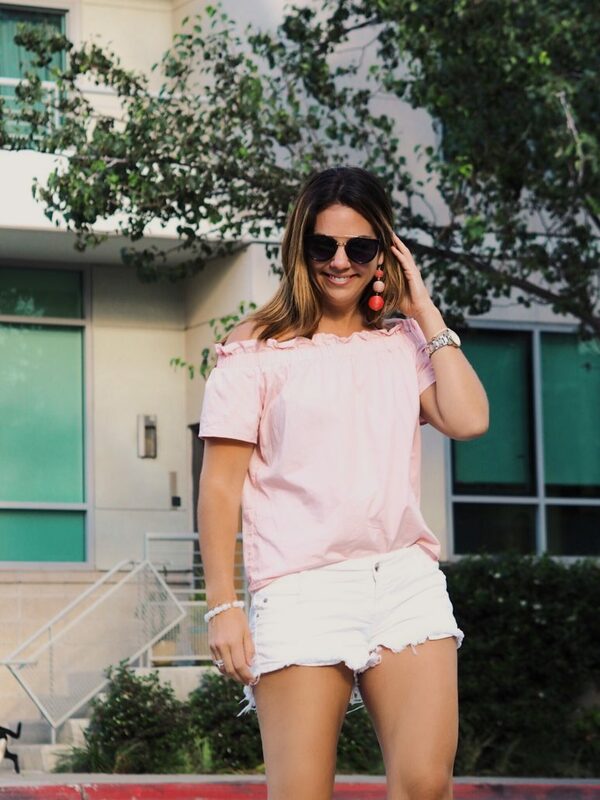 I love this top as it as it’s super girly and flirty, perfect for a day look with denim as I’ve styled here or with a skirt or white skinny jeans and wedges for going out in the evening. And… these converse shoes, I got them last year and wear them ALL the time all summer so, I recommend them, I sized down, normally I’m a 7 and these are a 6.5. The earrings are SO fun, right? I think they add a flare to the outfit and more color, they are also from Vocabulary and I linked a few other options below. Here’s your Bicoastal Beauty Tip of the week: Reminder! The Nordstrom Sale is open to the public starting tomorrow, July 21, 2017! 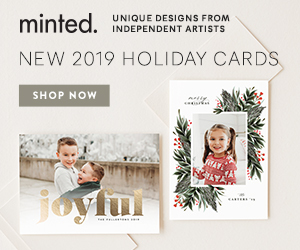 Shop it HERE!! Have you been yet? If so, what did you get, tell me below. If you plan on shopping, get those wishlist items ready in your cart for tomorrow and remember you can always buy now and return later! Let me know how you did, tell me below! Follow me on Instagram HERE Facebook HERE and Twitter HERE for my latest fashion finds, travel insights and positive inspiration.